The Boring Company has released yet another underground transit proposal for Los Angeles. 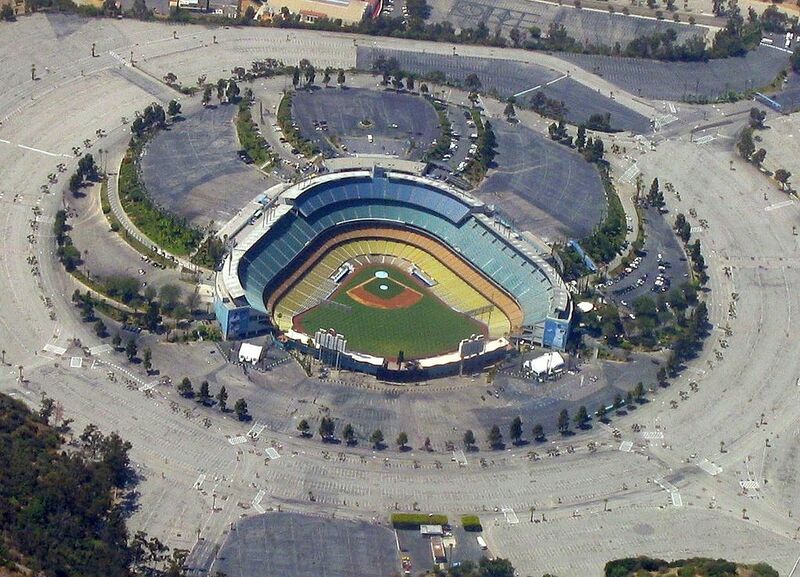 Wednesday night, embattled Boring Company CEO Elon Musk announced the so-called Dugout Loop, a proposed “zero-emissions, high-speed, underground public transportation system” that could potentially ferry passengers between the Red Line subway and Dodgers Stadium. The company released a series of possible proposals, with variations on route length and station origination point. 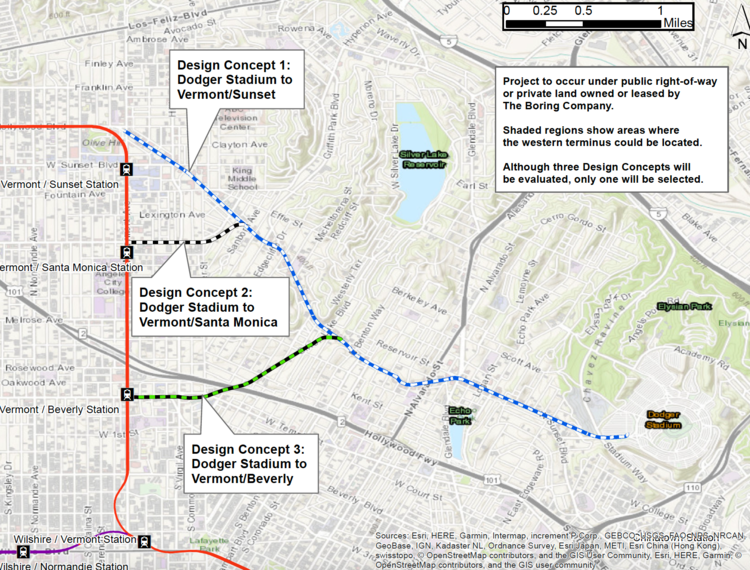 The ultimate aim of the proposal is to improve travel times between the East Hollywood, Los Feliz, and Rampart Village neighborhoods and the stadium, which is roughly 3.6-miles away. Boring Company estimates that the proposed loop would be able to complete a one-way trip in roughly four minutes and carry between 1,400 and 2,800 passengers per day, roughly the same number as are currently transported by the express Metro buses that currently operate between the stadium and Union Station using dedicated bus lanes. Here’s the hitch: Unlike conventional transportation systems that convey passengers in both directions simultaneously, Musk’s link would only be able to operate in one direction at a time. The limiting arrangement is a result of the small diameter tunnel that is being proposed for the route, similar to that of other Boring Company tunnels proposed for western Los Angeles and Chicago. The proposal comes after a week of questionable business decisions and erratic tweetstorms from Musk, and as L.A.’s Metro makes plans to embrace a proposed $125 million gondola system connecting the Union Station in Downtown L.A. with the stadium. 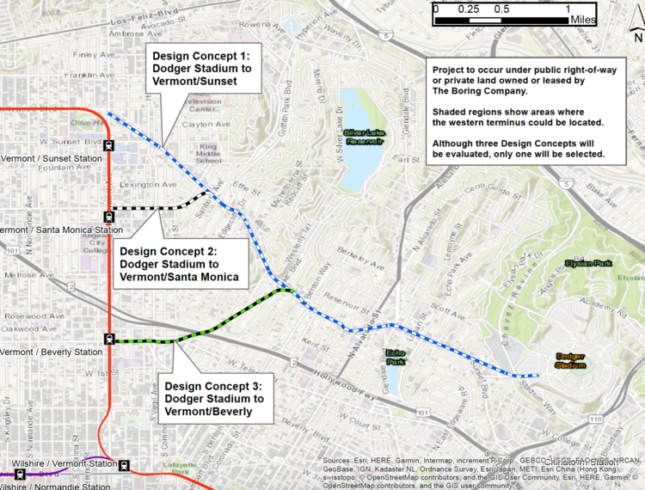 Backers for the gondola plan include former Dodgers owner Frank McCourt; Estimates for the transit link indicate the gondolas could ferry as many as 5,000 passengers per hour, with traffic moving in both directions simultaneously. Musk recently drew criticism and accusations of project “segmenting” for bypassing environmental review as the Boring Company attempts to move forward with a portion of a proposed Hyperloop route through L.A.’s Westside neighborhoods. Neighborhood groups outraged by the effort successfully sued to block the project. The proposal also comes as the Boring Company faces legal challenges for a similarly-vague proposal issued for Chicago that would link the city with O’Hare Airport.